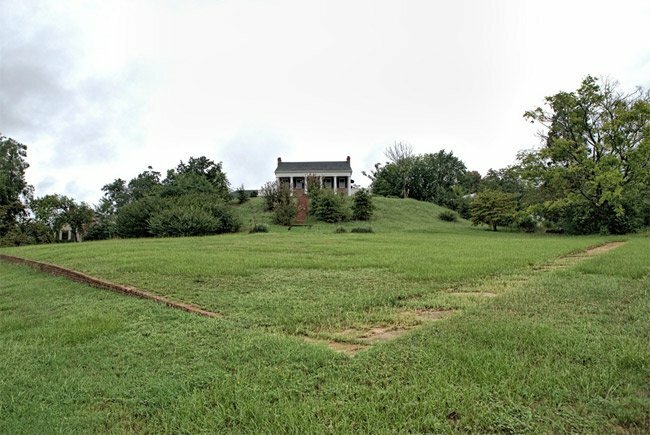 Though a stately home still graces this hilltop in North Augusta, little could compare to the first building that sat here – the expansive Hampton Terrace Hotel. The city of North Augusta was established during the turn-of-the-century by businessman James U. Jackson, and together with his friend Budd Clay “B.C.” Wall, the two men planned and designed a community that would compete with the prosperous neighboring cities of Aiken and Augusta. 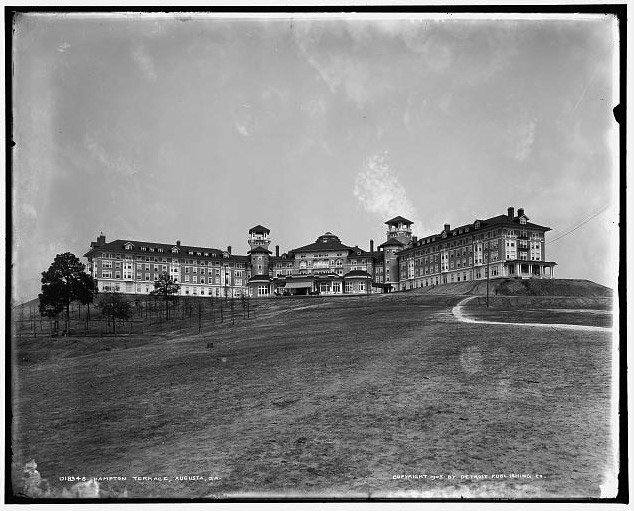 One of Jackson’s first plans to lure wealthy visitors from Aiken’s Winter Colony district was to develop the quintessential luxury hotel. 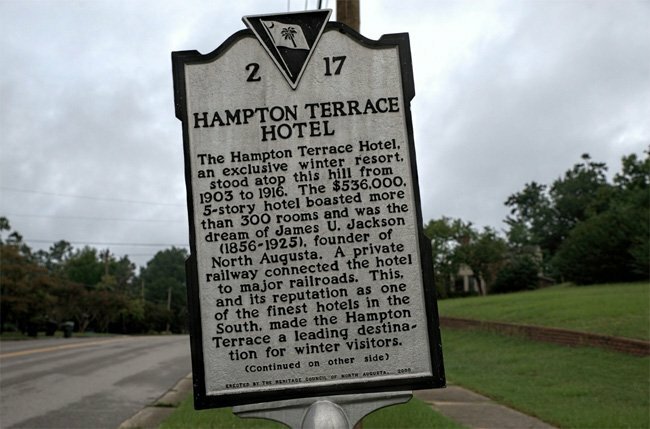 In 1903 Jackson realized his vision when he built the Hampton Terrace Hotel overlooking the burgeoning resort town. The five-story hotel offered guests 300 rooms, and when its popularity exceeded the hotel’s ability to accommodate its patrons, a guesthouse called Sesame Lodge was constructed to house the overflow. Sesame Lodge also afforded guests a more intimate bed-and-breakfast experience, a peaceful reprieve from the hustle and bustle of popular Hampton Terrace. The resort included accommodations that would appeal to the wealthy sportsmen Jackson hoped to attract. An 18-hole golf course was available, as were riding stables and even a 1,500-acre game preserve. 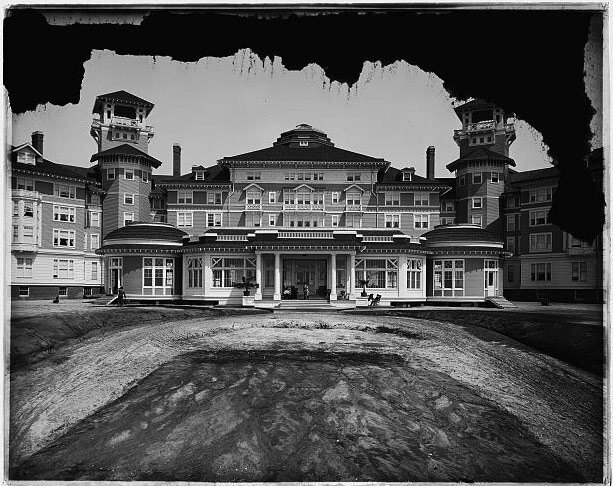 The Hampton Terrace Hotel also built the Seven Gables hunting lodge to accommodate guests enjoying the game preserve, though it was sold to New Yorker John Herbert soon after it opened. A private rail line brought guests to and from other railways, making travel more convenient and the hotel more accessible. The Hampton Terrace Inn indeed appealed to the country’s most affluent and powerful, including John D. Rockefeller and President-elect William Howard Taft, who was the guest of honor at a banquet here in 1909. 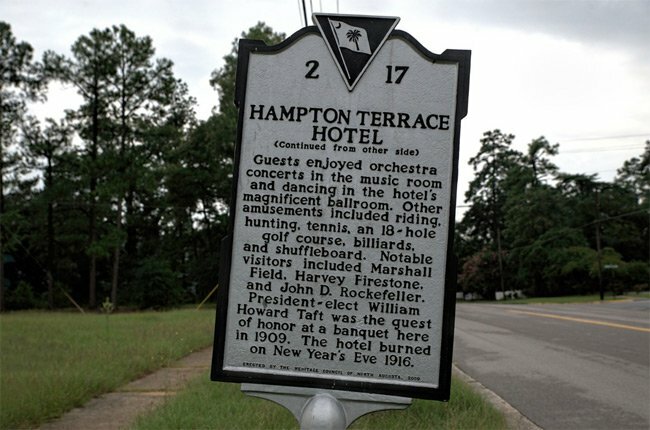 Sadly, the Hampton Terrace Hotel burned on New Year’s Eve, 1916, and was not rebuilt. The Sesame Lodge continued to operate until 1926, when a fire at the home of B.C. Wall led the Walls to stay at the inn. The Walls ultimately made the guest house their permanent residence. Following the loss of the Hampton Terrace Hotel, North Augusta no longer ranked among destinations for the elite. Today the owners of a private home enjoy the view once admired by many our nation’s creme de la creme. I heard that the hose connections didn’t fit the fire department hoses, so fire was fought with a bucket brigade. Thanks for this article! What a place that was! I wish places like this were still around. It’s a shame that the “site’ wasn’t preserved for something grand instead of being parceled out for home lots. It seems the berms the two wings were on are still there, based on what I can tell from Google Earth. Thanks for sharing this! Great article! Would have never known such a historic place was there!